From Afghanistan in 2001, to Iraq in 2003, to Libya in 2011. Now Syria is in the cross-hairs. Less than two years after 9/11, millions upon millions around the world took to the streets determined to thwart US President Bush’s criminal assault on the people of Iraq. Today, civilian populations in the US, Canada and other NATO countries seem to no longer mobilize against war. Distrubingly, supposedly “progressive” social justice groups seem to echo the rhetoric of the interventionist lobby. In the first half hour, guest Sarah Abed challenges the heroic narratives around Kurdish freedom fighters in Syria, and explains how Kurdish nationalism has been and continues to be an instrument of US and Israeli imperial ambitions. We then hear Mark Taliano correct the record on a ‘democratic revolution’ in Syria. Finally, a member of the Syrian-diaspora in Canada provides some insights into who the anti-Assad Syrians in Canada are, how they have helped derail social justice movements in Canadian cities, and how they continue to sabotage the unity of the Syrian people. Mark Taliano is a former high school teacher, an author and an independent investigative reporter, as well as a research associate with the centre for research on Globalization. In September of 2016, Mark travelled to Syria to corroborate his own research into the Syrian conflict and the distortions of reality presented in mainstream and some alternative media discourse. 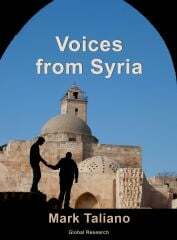 Earlier this year he compiled his findings in the book Voices from Syria, which is on sale now from Global Research.